We are observing many visitors are searching with Server Virtualization and landing to the articles on Virtual Private Server (VPS). In this article, we will discuss the basics of Server Virtualization Technology. That this why the article has been named Server Virtualization Technology : Basics of server virtualization. The idea of Server Virtualization is to run multiple servers on one physical machine. This is the basic of running the Virtual Private Servers. Server Virtualization is vast topic and needs super specialized knowledge to deploy them properly. We will keep the topic as easy as possible so that it becomes understandable to any level of interested readers. Why we need Server Virtualization? Because this technology provides High Availability, Economy and Flexibility. If one physical Server can run multiple instances of Server, obviously the costs is lowered for each such Virtual Servers : this is the basic why a Dedicated Server costs more than a Virtual Private Server. Software Virtualization The virtualization software can be used either to simulate an operating system or just an application on the Operating System. Operating System OS virtualization using container : OS level Server Virtualization Technology provides a complete runtime environment virtually inside a closed container. It needs no additional operating system. The advantage of this approach is the good integration. Examples are BSD jails, OpenVZ, Virtuozzo, Linux-VServer, User Mode Linux etc. System Virtualization using Virtual Machine Monitor (VMM) : This type of Server Virtualization can be done by hardware emulation. This type of Server Virtualization virtualization is known as hardware virtualization or paravirtualization. The individual host systems has its own full computer complete with all basic hardware elements like processor, hard disk drives, RAM etc. This emulation is often less efficient than direct access to the hardware, which can then lead to a reduced speed. VMware Workstation, Microsoft Virtual PC, VirtualBox are the examples such VMM Server Virtualization. VMware or Xen uses the VMI interface that acts as a joining region between the virtualization layer and host operating system. 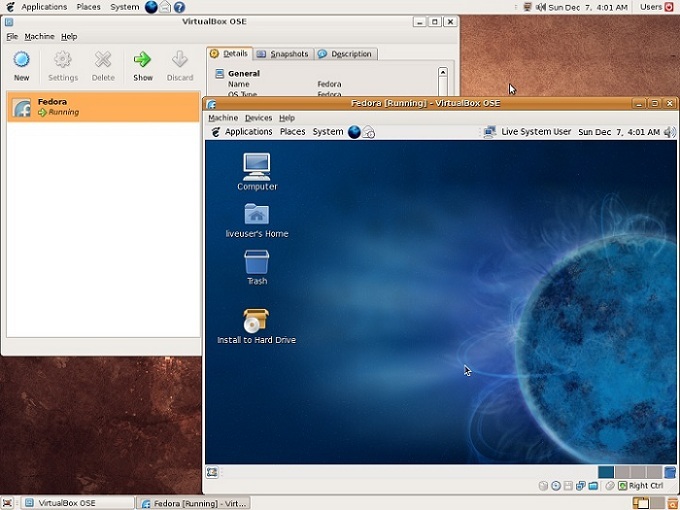 Screen shot showing Fedora running on VirtualBox. Screen Shot and some part of this article’s information source courtesy WikiPedia Germany. Application Virtualization is totally different kind of software Server Virtualization from the above two : this is the can be run without requiring them to be installed. Microsoft Application Virtualization, Thinstall VS are such examples. Hardware level Server Virtualization Hardware level of Server Virtualization is much more complicated. Hardware level Server Virtualization can be deployed by Partitioning , Domaining, Processor virtualization and Storage virtualization. VMware,Virtuozzo, Microsoft Hyper-V, Xen Server are popular Commercial Virtualization Solutions used for Server Virtualization. Where as Xen, Open VZ are Popular Free Virtualization Solutions used for Server Virtualization. This Article Has Been Shared 6149 Times! What’s up, all the time i used to check website posts here early in the break of day, as i like to learn more and more. back to your website: http://thecustomizewindows.com/2011/08/server-virtualization-technology-basics-of-server-virtualization/. Cite this article as: Abhishek Ghosh, "Server Virtualization Technology : Basics of server virtualization," in The Customize Windows, August 4, 2011, April 26, 2019, https://thecustomizewindows.com/2011/08/server-virtualization-technology-basics-of-server-virtualization/.